Whatever you want, you can have. Rock legends Status Quo are back this winter and are all set to rock The Hydro’s socks off! Rick Parffitt and Francis Rossi have been the mainstays of the group since the 70’s and their trademark four bar boogie sound has made them an institution. Confirmed to play at the Glasgow venue on Wednesday the 18th December 2013 – tickets are now on sale. 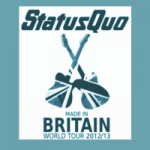 Get Status Quo Tickets now.